Many good pet supplies stores used to carry Green Duck Cat Furniture. I'm not sure if they've gone out of business or what, but I haven't been able to find their products anywhere! So if you find it, please let me know where so that I can tell other readers. 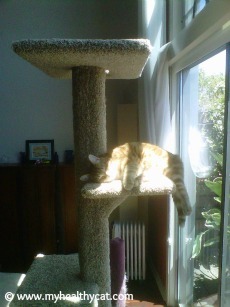 But in any case, you can use these standards to find the best cat trees, scratching posts, perches, etc. Green Duck Cat Furniture has an extensive collection of every type of cat furniture your cat could ever need. From single scratching posts or tunnels to wall-high cat trees and towers, you can find it all from this company. The quality of the construction is one of the things that makes the products from this company stand out. They pay a lot of attention to the details. All of their pieces are carefully inspected. They make sure all the joints are tight and that the carpet is securely attached from edge to edge. All the furniture is assembled using drywall screws. No nails are used that could harm you or your cat. Plus, over time, nails can loosen and lead to a less sturdy cat tree, cat house, etc. The screws used help to ensure sturdier and longer-lasting furniture. No glue or other chemical adhesives are used in the construction. (Many other manufacturers use chemical adhesives that can take literally months to evaporate—and your cat will be inhaling the chemicals all the while.) The materials used by this company are high quality and environmentally friendly. In addition to quality construction, the materials used by Green Duck Cat Furniture are what makes their furniture stand out from other companies'. The carpet used is made entirely from recycled material and is "earth friendly." It's also fade resistant. No longer do you have to worry about keeping pieces out of the sun to prevent fading. And after all, we know how kitties love to be in the sun! The carpet used is also stain resistant and easy to clean. You can even use bleach and water to safely take out tough stains (but be sure to rinse out all the bleach or other cleaning chemicals used). Only plywood and OSB styrated board are used in Green Duck Cat Furniture. No particle board is used. The posts are made from sturdy Douglas Fir. Sisal rope is used to cover some of their scratching posts and cat trees. Sisal is a natural fiber. It's harder than carpet and softer than wood. Most cats love to scratch a sisal post. Many of the smaller pieces of cat furniture, like cat tunnels, cat scratching post, and window perches come already assembled. You'll need to do some minor assembly for some of the larger pieces, like cat trees and cat towers. However, you'll usually be able to do the assembly using only a Phillips screwdriver. You'll have over a half dozen colors to choose from for most pieces of pet furniture. Cat Furniture - Information on kitty condos, scratching posts, pet beds, cat trees, etc., for your healthy cat or kitten.